Stamford Raffles’s rationale for dividing Singapore into ethnic subdivisions while town planning in 1822 may have been geared towards achieving orderliness, but it is the 21st century traveler who’s thanking him today though for a slightly different reason. With modernisation changing the look of cities across the world and making them increasingly homogenous, it is such little pockets that offer character and variety to a landscape of highrises and shopping malls. The buzz around the alfresco fruit and vegetable stalls crowded with saree clad women bedecked in gold bangles and flowers in hair, stooping over mangoes or tomatoes to check their ripeness is what defines Little India for me; the vibrant Chinese lanterns, souvenir stalls, Chilli crab outlets, calligraphy shops, temples, mahjong playing elderly uncles and the constant ebb and flow of backpackers jump out at me when I set foot in Chinatown and finally when I enter Kampong Glam, I’m steered by the palm fringed gold dome of the Sultan mosque, shops selling carpets, perfumes, silk, batik and laces, Middle Eastern eateries embellished with lamps, chandeliers and other moorish trinkets and the smell of biryani and shawarma filling the warren of narrow streets around mealtimes. What’s common to all these precincts however is the ubiquitous shophouse – a timeless beauty, which is a delight to sketch, photograph or just be in the company of. On my last week’s trip to Kampong Glam, I sat under a huge shady tree and sketched this pleasant corner of Blue Jaz Cafe and Muzium Cafe both housed in quaint shophouses on Bali Lane with plenty of potted plants in between them. For the two hours I spent on my line drawing, I watched the cafe staff sweep leaves off the floor, dust, mop, wipe and arrange furniture, and finally grow antsy and glance uncomfortably at our direction. The footsteps of the lunch crowd descending from the nearby offices was unmistakable. We did put them at ease by wrapping up our easels and clearing off in seconds! 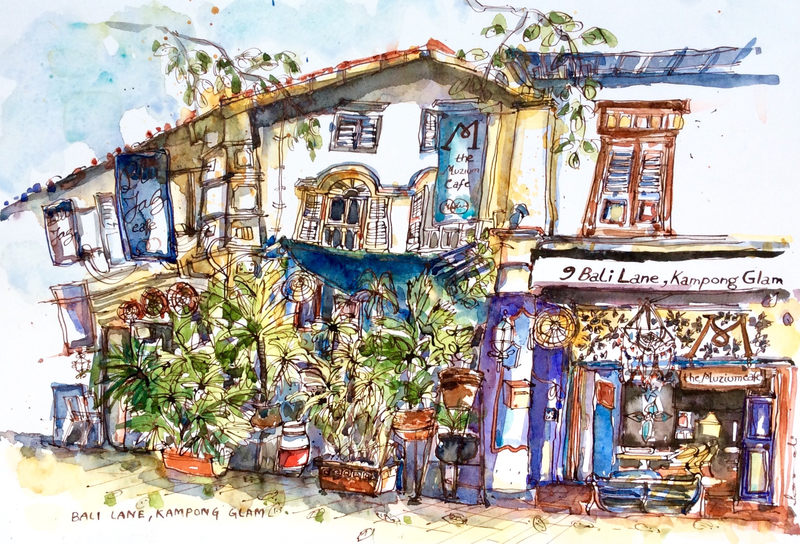 This entry was posted in Daily Vignettes, Shophouses and tagged Bali Lane, Blu Jaz, Egyptian, illustration, Kampong Glam, Moroccan, Muzium Cafe, Raffles, Singapore, sketching, Stamford, Stamford Raffles, Turkish, urban sketching on July 21, 2015 by Somali Roy.